Yesterday was Cabernet Day, an online wine tasting event celebrating the noble grape. These events are pretty cool because they bring together wineries, retailers, and enthusiasts to celebrate a specific grape variety. You might remember my previous post about Pinot Noir Day where I tasted a wine from California's Santa Lucia Highlands AVA and compared it to Pinot Noir from Oregon's famed Willamette Valley. California pulled an upset in that one so I thought it would be fun to again compare California to another wine region known to make excellent Cabernet Sauvignon: Washington. It was just a weeknight so I didn't want to get too crazy price-wise. I wanted to choose wines that were textbook representations of their respective categories. Comparing wines from Robert Mondavi to Columbia Crest provided a great way to compare stylistic differences between California and Washington at similar price points. When Wine Spectator dropped a 95 point rating on the 2005 Columbia Crest last year and it started showing up on retailer shelves for $19.99 there was quite a frenzy in the value-hunter contingent. Check the comments in this piece- Costco locations sold out within 4 hours of the wine arriving. Things got even crazier when Wine Spectator named it their 2009 Wine of the Year (here is a link to a pdf of the full list). The wine virtually disappeared from retailer shelves if offered anywhere near retail price. If you can find it, the wine now sells for over $100. The 2005 Robert Mondavi Oakville is far less heralded. I think of Mondavi Oakville as being a textbook example of Napa Cabernet, and such a solid brand. Everyone knows the Robert Mondavi label so I often recommend their less-than-$20 Napa Valley Cabernet as a nice/safe bottle of wine to share with friends that's readily available. Strangely, although the wine is usually rated by Wine Spectator (and fares well, 93 points for the '04 vintage and 90 points for the '06) neither Wine Spectator nor Wine Advocate rated the wine. As a result, I was able to pick up the wine in the mid-$20s last year. I poured a glass of each of the wines and asked my wife to mix them up while I stepped out of the room so I could get a sense for whether each wine aligned with my preconceived notions of Napa and Washington. And they did. The Mondavi presented itself in a rounder, softer, sunnier light with sweeter tannins. More black fruit than the laser-beam of red fruits present in the Columbia Crest Reserve. Where the Columbia Crest excelled was with its intensity and length. By length I mean the its confident presence from when it enters your mouth until long after you've consumed it. Saturday, April 11, 2009 - A little closed on the nose even after being open for an hour prior to drinking. Very nice on the palate- flavorful and enjoyable. Wonderful finish. I thought this was an outstanding wine, and at just over $20 (street price) it is a very good value. Back up the truck. Thursday, September 2, 2010 - Opened up aromatically within just a few minutes after opening this time. If you like wine on the younger side I think this wine is ready to drink, but I think it'll peak in another two years or so. I say that because after a few hours in the glass it developed softer characteristics not present on initial opening. 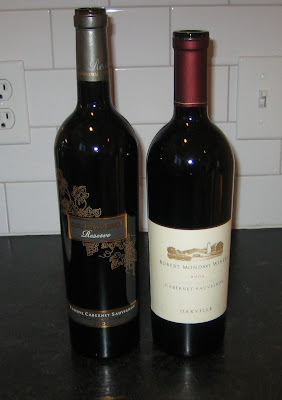 Monday, February 22, 2010 - Textbook Napa Cab at a relatively affordable price. Big dark fruit on the nose backed up with moderate menthol aspects that would normally turn me off but in moderation were enjoyable. Dense on the palate with firm but enjoyable tannins. Considerable oak influence but I liked it. Consistent from bottle to bottle. Outstanding. Thursday, September 2, 2010 - The wine is even more approachable right after opening than I remember it. Big, generous, voluptuous and enjoyable and I didn't detect the menthol I noted in previous bottles. A fair amount of acidity and still-frim tannins provide nice structure around which to enjoy this otherwise "yumma gumma" wine. Each of these wines nicely represent the regions they come from. Both purchased in the mid-$20s a couple years ago, they compare favorably with wines costing up to $100. Outstanding value, classic American brands, and delicious high quality wine- what more can we ask for? The fact that the Columbia Crest is selling for $100 puzzles me. Why? Because Wine Spectator's Wine of the Year program considers value (among other things) when determining its list. This is not the case with Wine Spectator's numerical ratings in which price isn't a consideration. That being the case, they're not saying it was the best wine they tasted. That would be easy and boring to determine- just look at the highest numerical rating. They're saying it was the most "exciting" wine that came to market that year. The American economy was terrible in 2009, Columbia Crest produced an outstanding high-volume wine, and Wine Spectator, I think, wanted to acknowledge the current mood of the wine market. I think it was a good pick, but why are people thinking paying over $100 a bottle for this wine? I don't know. The 2007 Columbia Crest Reserve Cabernet is just coming to market if you'd like to try it. I've gotten a couple tips from friends that it's available for $32 at the Waltham, MA Costco. There are quite a few nice value plays in 2007 Napa Cab like this one, and even some 2006s that are still available in the market like the 94WS Hall Cabernet for around $30. I'll be talking about these value plays more in coming weeks. Subscribe to the site and you'll get updates sent to you via E-mail when there's new content here on the site. Question of the Day: What do you think? Napa or Washington for value in Cabernet right now? Who are some of your favorite producers?